The somewhat beguiling name “Triptych” actually encompasses a four part ensemble which focuses upon repertoire for traverso, voice and basso continuo. Such instrumentation allows for programming which embraces the broad range of musical styles which co-existed during the Baroque. 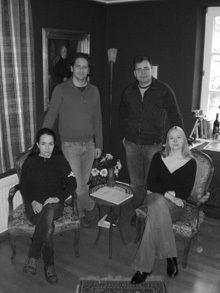 Triptych evolved as an ensemble of musicians committed to historical performance practices and innovative programming. Its members met whilst students of early music at the Royal Conservatory of the Hague and now enjoy performances together across Europe. Their concert performances have paid tribute to the early 18th Century fashion for all things Italian with cantatas by Hasse and Handel, alongside sonatas by Schenk and Leclair. In addition, they have performed programmes exploring the earliest of French works for the transverse flute and its sole inspiration – the voice.